With a special use designation, the R-3 also allows for the Continuing Care Retirement Community use that PHG is seeking, as well as for an assisted living facility. Assisted living will be part of the CCRC facility that PHG is proposing. The R-3 category also allows for personal care homes, with up to 15 persons under care, even without a special use designation. The R-1 zoning the property currently holds does not allow for a CCHR, assisted living facilities or personal care homes under any circumstance. Once the property is rezoned at R-3, any of these uses–plus for two-family duplexes, multi-family townhouses and multi-family apartments--can be made of the property, whether Presbyterian Homes builds its facility or decides not to do so. 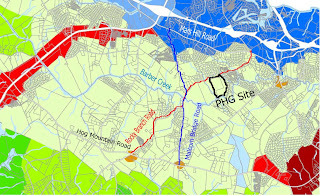 In 2008, PHG asked for and received a rezone of 55 acres on Bishop Farms Parkway off Experiment Station Road near Butler’s Crossing. The land had been zoned for agriculture, but PHG asked to rezone the land for Office-Institutional-Professional (OIP) use, which does not require a special use designation for a CCHR. PHG suspended the project in June of 2009 because of “poor economic conditions,” Frank H. McElroy Jr., president and CEO of PHG, told Oconee County Board of Commissioners Chairman Melvin Davis in a letter Davis received on Aug. 5 of this year. The land remains zoned as OIP but has not been developed. PHG is not seeking an OIP designation for the land on Rocky Branch Road. All current use in the area is either agricultural or residential, and the county usually uses OIP as a buffer zone between residential areas and business or industrial areas. Oconee County Planner Brad Callender told me in a conversation on Sept. 29 that the Planning Department staff could recommend as a condition of rezone for the 96 acres on Rocky Branch Road that the use be restricted to CCHR. But planning staff recommendations are just that, and they often are modified by the Planning Commission or the Board of Commissioners. The Planning Commission makes recommendation to the BOC, which has final authority on all zoning matters. The BOC zoned the Rocky Branch site for R-1 for a single family subdivision called Autumn Glen in 1997. Roads and other infrastructure were built on the site, but no houses were constructed, and the site is currently closed to the public. The requested R-3 rezone is consistent with the current Future Development Map for the county, which designates most of the area between Hog Mountain Road on the south and Mars Hill Road on the north as Suburban Living. The area north of the proposed PHG site is residential. Old Waverly and Baker’s Acres are just across from the site. Rowan Oak straddles Rocky Branch Road, and the southern part of that development is just east of the 96 acres selected by PHG. Rowan Oak was developed in phases, and the second phase, referred to as The Lakes at Rowan Oak, abuts the proposed site. Much of that section currently is undeveloped. The area to the south, across Barber Creek, is agricultural and residential. The area to the west is agricultural. The R-3 Multi-Family Residential District is “designed for medium density suburban residential development,” according to the Unified Development Code for Oconee County. Development of lots in an R-3 district is allowed only if the development has a water and sewer system approved by the state Department of Human Resources and the Oconee County Health Department. On Aug. 15 of this year Smith Planning Group, 1022 Twelve Oaks Place, near Butler’s Crossing, approached Utility Department Director Chris Thomas asking for water and sewer services from the county for the PHG site, my examinaton of email correspondence among county officials showed. That was 10 days after PHG CEO McElroy informed BOC Chairman Davis that PHG intended to develop the Rocky Branch Road site. McElroy mentioned the need for sewer capacity in his letter. Davis met with McElroy and Bob Smith on Aug. 8. As I wrote in my earlier posting, Thomas, County Administrative Office Alan Theriault and County Attorney Daniel Haygood initially said that the county could not grant sewer capacity to a residential project such as the one PHG was proposing. The BOC, at Thomas’ request, had set as policy that future sewer capacity is “restricted to commercial usage.” That policy was set on Dec. 2, 2008. Thomas did write a letter on Aug. 31 indicating that water and sewer capacity of 62,906 gallons per day is available. The documents I received indicated that Haygood had advised that another decision of the Board made that decision the correct one. After I posted this story, Theriault sent me a copy of an earlier sewer use policy approved by the BOC at a special called meeting on Aug. 15, 2007. That policy stated that no more than 50 percent of sewer capacity at either of the county’s two treatment facilities could be for residential use. That allocation was changed by the Board vote in 2008, but the Board did not change the exemption for CCRC facilities. In his Aug. 5 letter to BOC Chairman Davis, PHG President McElroy said he believed the economic outlook in Oconee and Clark counties “is brightening.” He said that justified the decision to go forward with the new plan. He cited the Caterpillar Plant, the Epps Bridge Centre development on the Oconee Connector Extension, and the development of the Health Sciences Campus at the University of Georgia as examples. He wrote that PHG had signed a contract to purchase the 96 acres on Rocky Branch Road, now owned by Autumn Glen LLC. Rod Wright is the registered agent for Autumn Glen LLC, according to state records. Most of these are in Butler’s Crossing, which is 5 miles from the Rocky Branch Road site but only about a mile from the Bishop Farms Parkway site PHG had selected in 2008. The new site is about 3 miles from the theater and restaurants planned for the Epps Bridge Centre, compared with 5 miles for the Bishop Farms Parkway site. In addition to the rezone for the Rocky Branch site, PHG will be asking for a variance from the Unified Development Code so it can construct two buildings higher than the allowed 40 feet. The rezone proposal is currently under review by the Northeast Georgia Regional Commission. It is scheduled to be before the Oconee County Planning Commission on Nov. 19 and the BOC on Dec. 4.